Is dig and be dug in return. So goes the poem “Motto” in Langston Hughes’s 1951 jazz collection, Montage of a Dream Deferred. The list of my favorite Langston Hughes poem would be long indeed, but no volume of his poetry makes my heart sing like Montage of a Dream Deferred. Not only does it include justly famous poems like “Harlem” and “Theme for English B” and lesser known poems like “Motto.” But it also – taken as a whole volume as Hughes intended – provides a marvelous portrait of the African American community in post-World War II Harlem. The story goes that Hughes wrote Montage of a Dream Deferred in a creative outburst in one week in September 1948. Hughes had just moved into his own home after being a renter his entire adult life. Writing to a friend, Hughes described Montage as “a full book-length poem in five sections,” “a precedent shattering opus—also could be known as a tour de force.” I completely concur with Hughes’s self-assessment: Montage of a Dream Deferred is very much a tour de force. In his early work, Hughes showed how the blues as a uniquely African American musical form shaped his poetry. Some time back, I explored his landmark 1925 poem “The Weary Blues” and the way it exemplified the blues influence on Hughes’s poetry. By the 1940s, however, jazz had more than come into its own, embodying the vast creativity and artistry of African Americans. Jazz is just right as a vehicle for Hughes’s poetry, for he can riff on a poetic theme much as a band member might riff on a musical motif set down by the leader. Jazz was, of course, a distinct creation of African American musicians. Though there were many white musicians who became interested in and mastered jazz and pushed it in new directions, jazz was largely an African American cultural phenomenon. [T]his poem on contemporary Harlem, like be-bop, is marked by conflicting changes, sudden nuances, sharp and impudent interjections, broken rhythms, and passages sometimes in the manner of the jam session, sometimes the popular song, punctuated by the riffs, runs, breaks, and disc-tortions of the music of a community in transition. Now that the motif has been established – the “dream deferred” – Hughes can riff on it throughout the volume, which he stressed was to be seen as one long poem rather than a collection of 87 individual short poems. He employs different voices, takes different vantage points, takes the same words and plays them back to us in a different way. Even a short and seemingly straightforward poem like “Harlem” (taught by many an American literature instructor and “sampled” by Lorraine Hansberry in the title of her pioneering play A Raisin in the Sun) can take on a deeper resonance when it’s set in the context of this jazz-in-words volume of poetry. Appearing about midway through the book, “Harlem” opens with one of the most well-known lines in American poetry: “What happens to a dream deferred?” That question is at the heart of this book of poems. In his 1940 autobiography, The Big Sea , Hughes said, “I tried to write poems like the songs they sang on Seventh Street. . . . Their songs—those of Seventh Street—had the pulse beat of the people who keep on going.” Eight years later when he wrote Montage of a Dream Deferred, he succeeded magnificently in capturing that pulse beat. To read Montage of a Dream Deferred, you’ll need to purchase The Collected Poems of Langston Hughes , edited by Arnold Rampersad. It is the only place the 1951 volume is available (and except for a few individual poems, you can’t read Montage of a Dream Deferred online). A great recording of many of Hughes’s poems, including several from Montage of a Dream Deferred, is an album by Ruby Dee and Ossie Davis. It’s available only on vinyl, but if you’ve got a turntable, you’re in for a treat. If you want to go deeper, consider taking the Langston Hughes walking tour the next time you are in Harlem. The Big Sea: An Autobiography will give you insights into Hughes’s life, as will Selected Letters of Langston Hughes . True aficionados will want to read Arnold Rampersad’s two-volume biography of Langston Hughes. 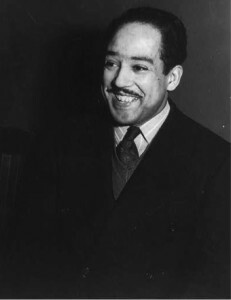 Volume I of The Life of Langston Hughes is subtitled I, Too, Sing America and covers the years 1902-1941. Volume II is subtitled I Dream a World and covers the years 1941-1967 (the year of Hughes’s death). Listen:Listen to Langston Hughes read “Harlem,” arguably the most important poem to come out of Montage of a Dream Deferred. You can also watch actor Danny Glover recite the poem. Image Credit: Langston Hughes, photo by Jack Delano (from Library of Congress Prints and Photographs Division, Reproduction #LC-USZ62-43605). Thanks for this, Linda. Since Charlottesville I too am going to Langston Hughes, especially his truth-telling “Let America Be America Again.” Equal parts wrenching pain and unshaken faith. I marvel at the amount of hope he could express at that time. We have some mighty ones behind us showing a good way forward.